Yesterday after 17 long hours in the train I got to Bodø where the ferry leaves for Lofoten. After various adventures which you have to read Norwegian to hear about I was picking some ground elder to eat which I found in town and thinking that nothing like this grows on the mountain where I am going, only white reindeer moss. Just beside was a museum so I went in and saw a small unusual looking man standing and joiking to himself beside the Sami exhibition. Naturally I got talking to him. He told me of an old aunt of his who was a shaman. Yes he said it was unusual for a woman to be a shaman but she was, and people came from far and wide to see her. Her name was Britta Sjulsson and even royalty came to visit her. She was able to read signs from birds and beasts and she also read the moon. Whether it was round or oval, which colour and the other stars. And she could predict the weather and other things. She also had a great knowledge of plants and he told me of something called Gompa, a mix everyone he knew as a child used to make. It was mainly angelica and something else which I dont recognise called Tolta. And she would chop it and cook it and then leave it for some months and it developed a jelly like consistency and as a child he loved it. He said it is cleansing and gives masses of energy. And can also be used on wounds and sores. She also cooked up blueberry leaves and heather for tea. And guess what, she also cooked up reindeer moss! So I can eat that too. And she had a large flock of reindeer, and no husband. But the reindeer were so tame that they hung around her place, and he said they felt safer there from the many wolves there were in that area at the time. 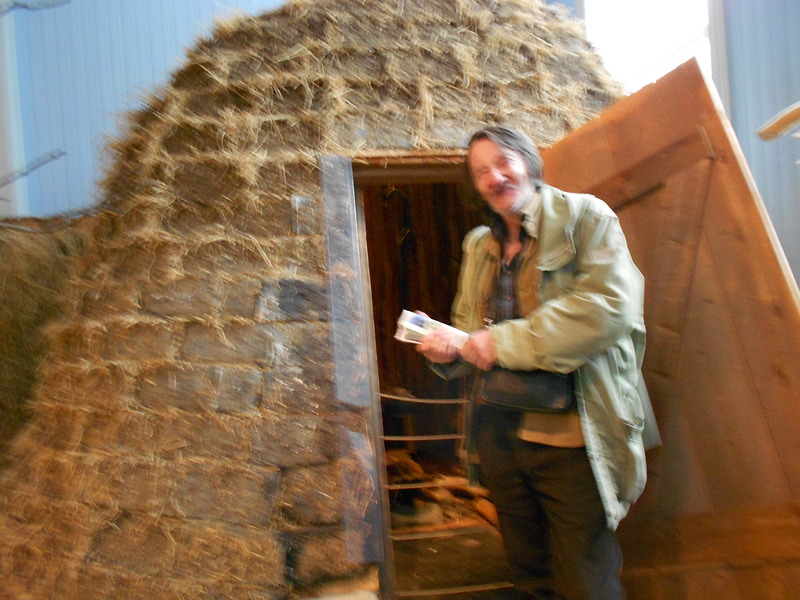 His name is Olav Gaurek and he invited me to the Vandrehjem where he was staying so I could cook up the ground elder. It was getting late and I needed to get out of town to hang up the hammock. It was quite far into a housing area and the mountain seemed to rise straight out behind the houses with no path. The old people I met said there should be a path there behind someones house so I walked up through the garden. I couldnt see anyone there and it was extremely steep but I climbed up. There beside the mountain was a hefty fence so I wasn’t quite sure if I was still in their garden. By now it was a birch wood and I was boiling hot so I decided just to stop anyway. The sky was a beautiful blue and so I just put the hammock on the ground to sleep. Olav Gaurek had said it wouldn’t rain so in veiw of his aunts gifts I thought it was safe not to hang up the tarp. At 3 in the morning the rain was falling. I jumped up and hang it up very quickly. Luckily for me I now can do the bowline hitch very fast and soon it was undercover and I was listening to the rain pattering. But I knew I had to was going to do a radio interview early today and wasn’t too sure that the tarp would keep me dry and it was hard to get back to sleep. One not so good thing about travelling alone is that its hard to find someone to give you a hug when you feel like one which I did just then. But luckily I remembered something I discovered recently. Being a storyteller you can be quite good at visualising but I’m sure anyone can do it. You imagine that you are lying on Gods hand. I don’t think you need to beleive in God either to do this. And then you can imagine that the sleeping bag in this case is very gently hugging you which it is doing in fact and even the air. So I got to sleep again. I feel somewhat like a snail, not slimey though I will no doubt get slimey after many more days not washing but a snail in a good way. That I am carrying my shell on my back. And I walked down to the radio this morning and did the interview and then walked up the hill. There was the cathedral with a very welcoming looking Christ and beside it was a large crowd listening to a brass band in the sun. And as I stood there listening and watched the local crowd I felt pity. A rare feeling of pity for this race of ours which seems determined on extinction without even really noticing the direction it is going. Hope this doesn’t sound dismal its not meant like that at all, I feel most alive and happy. 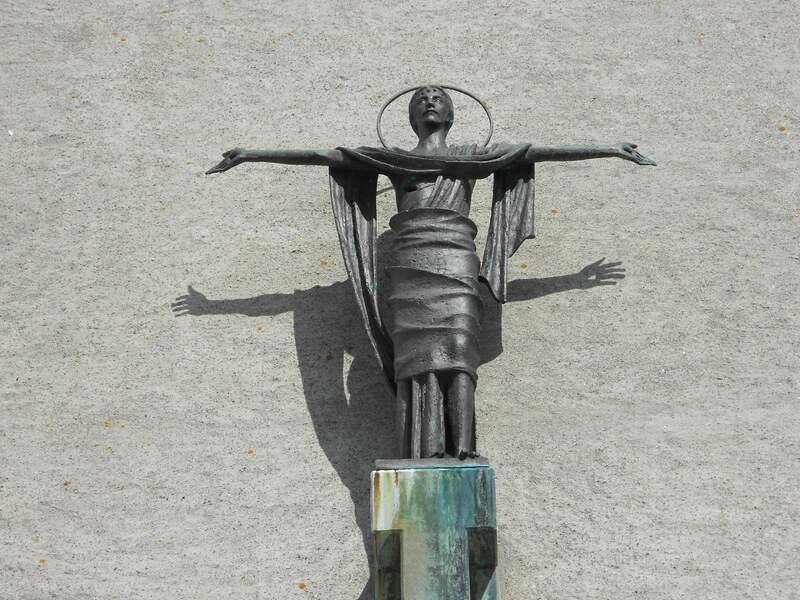 I like this standing Jesus sculpture whith open hands. It looks quite unusuall. Have a good time in the mountains! kjære Georgiana, takk for vakre tanker og beskrivelser…gleder meg veldig til å følge bloggen din i sommer, og ønsker deg en velsignet tur videre! This room is simply aubetiful. I’ve been looking for that leather rug and haven’t been able to locate it. I saw it in brown but I need black. If you happen to run across another one in black in the NY/NJ area please post. It would be a big help.